For more than 40 years, the law firm of Joseph S. Friedberg Chartered has helped countless individuals from high-profile corporate executives, to professional athletes and college students resolve state and federal criminal charges. Respected by his peers, prosecutors and judges, Joe Friedberg knows how to successfully defend people facing all types of criminal charges, including fraud and white collar crimes, drug charges, gambling offenses, game and wildlife violations, and criminal sexual conduct. Joe Friedberg has won 17 federal jury acquittals and has a 75 percent acquittal rate in state trials. He has served as the president of the American Board of Criminal Lawyers. He was selected by Minnesota Law & Politics as one of the 100 most influential lawyers in state history. The consequences of a criminal conviction can be extremely damaging to your life. You could face prison, costly fines and restitution, and a permanent criminal record. Since the stakes are so high, you should never talk to police or accept any plea deal without discussing your case with an experienced criminal defense lawyer. 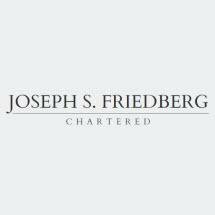 The law firm of Joseph S. Friedberg Chartered is located in Minneapolis and serves clients throughout Minnesota, South Dakota and Iowa resolve state and federal criminal charges.